The Promoter is KFC (Pty) Ltd (“The Promoter”). 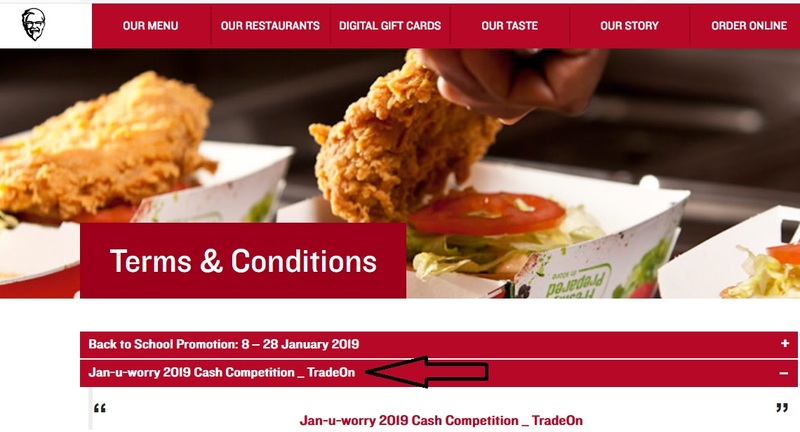 This competition is open 08 January 2019 to 25 February 2019. Any entries received after midnight on the last day will not be valid and not be considered. who are in possession of a valid identity document, except directors, members, partners, employees, agents or consultants of or any other person who directly or indirectly controls or is controlled by the Promoter or marketing service providers in respect of the promotional competition, or the spouses, life partners, business partners or immediate family members, or anyone who within a period of 183 days preceding this competition has won any competition organised, promoted, or conducted by the Promoter, or who resides at the same address as such a winner, or who uses the same telephone number to enter this competition. ** To enter, you have to spend a minimum of R100 and simply write your name, cell phone number, email address and your ID number on the bottom of the till slip, where indicated and then drop it into the entry box provided in store. ** KFC Kalahari Mall; KFC Kathu 2; KFC Hartswater; KFC Polkadraai. ** The winners will be selected at random by way of a draw conducted by the Promoter or a person appointed by the Promoter and the 5 prizes of R20 000 each will be awarded to the winners of the competition. ** The draw will take place on Friday, 8 March 2019 and the winners will be notified by telephone, by Wednesday, 13 March 2018 and thereafter confirmed in writing. The organisers will endeavour to contact the prize winners on the telephone number and address provided. ** If, however, they cannot be reached after 6 attempts have been made during business hours within a period of 72 hours for any reason whatsoever, the prize will be forfeited and another winner/s will be selected in accordance with the competition rules. ** The prize is not exchangeable for cash and not transferable and all winners will have to claim their prize within 30 days of the draw having taken place in South Africa and at that time identify themselves with a bar coded South African ID book or South African driver’s license and sign a receipt for any prize received or provide an address in South Africa or other means whereby the prize can be delivered to them in South Africa , and failure to claim the prize or a refusal or inability to comply herewith will disqualify the winner and a new winner may be drawn in their place at the sole discretion of the Promoter. ** All risks in the prizes pass to the winner upon notification of having won a prize. Where necessary, the winner shall ensure that all prizes are insured against all risks including damage to the prize as well as damage to third party property and persons. ** Such insurance is for the cost of the winner and neither the Promoter nor any other party associated with the competition will be liable for the costs thereof or be liable should such insurance not be in place. ** Where cash prizes are won, the winner may be required to provide proof of identity, proof of address as well as a tax clearance certificate or any other documents generally required by banks in terms of the Financial Intelligence Centre Act. ** The winner has to provide his/her banking details as the 5 cash prizes of R20 000 each will be paid through an electronic funds transfer into a South African bank account.